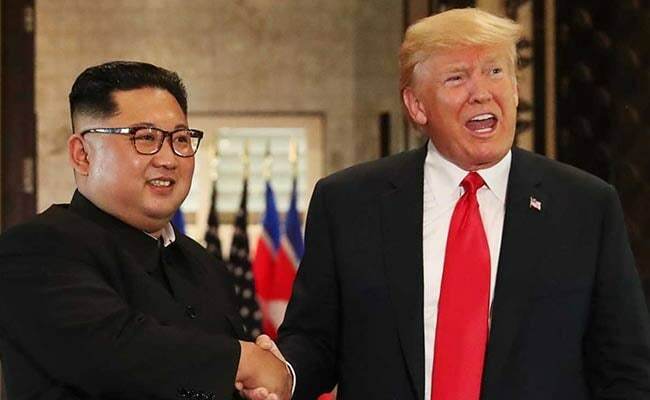 Amid Denuclearisation Pressure, Kim Jong-Un Slams "Brigandish Sanctions"
Kim Jong-Un and US President Donald Trump held a groundbreaking summit in Singapore in June, which the US leader touted as a historic breakthrough. Donald Trump met Kim Jong-Un at a landmark summit in Singapore in June. North Korean leader Kim Jong Un attacked "hostile forces" over "brigandish" sanctions, state media reported Friday, as Washington seeks to maintain pressure on Pyongyang over its nuclear programme. Kim and US President Donald Trump held a groundbreaking summit in Singapore in June, which the US leader touted as a historic breakthrough. But there has been little movement since and the North has criticised Washington for its "gangster-like" demands for complete, verifiable and irreversible disarmament. The US has urged the international community to maintain tough sanctions on the isolated regime, and the US Treasury this week announced measures against Russian and Chinese companies for violations. On a visit to the construction site of the Wonsan-Kalma coastal tourist area, Kim rebuked what he called "hostile forces" for "trying to stifle the Korean people through brigandish sanctions and blockade", the Korean Central News Agency (KCNA) reported. But Pyongyang is keen to preserve what it calls a "new era" of relations with the US and Kim stopped short of criticising the country by name. Wonsan-Kalma is a vast development on the North's east coast, which Kim ordered to be ready by October 10 next year, an important public holiday which marks the founding of a precursor to the ruling Workers' Party of Korea.